I was excited when the book Does My Head Look Big in This? came out a few years ago. In that book, author Randa Abdel-Fattah tells the story of Amal, a young Australian Muslim woman who decides to wear hijab and navigates the challenges of expressing her identity as an Australian Muslim. Books about young Muslims in the West (a political and not geographic definition, obviously, given that I’m including Australia) aren’t exactly common, so it’s always exciting when these things do come up. Abdel-Fattah’s second book is Ten Things I Hate About Me. Unlike Amal, Jamilah, the protagonist of this book, works hard to keep her Australian identity separate from her Lebanese-Muslim identity. At school, she is Jamie, and with her bleached hair and coloured contacts–no one knows that she is Arab or Muslim. The novel takes us through the stress and anxiety that Jamilah faces in keeping her culture and religion hidden, and her eventual path towards finding a sense of comfort to be able to express all elements of her identity. I guess it’s useful to have these characters there as a way of challenging some of the stereotypes that readers may have, but as Melinda wrote about in relation to Does My Head Look Big in This?, sometimes it felt as if the novel was banging us over the head with its attempts to challenge stereotypes. I would have liked to see some of these characters be a bit more subtle and complex. This silence, however, takes its toll. When she later talks about another moment where Ahmed stands up against racist comments, she reflects that, “The same prejudice and bigotry that silences me, vocalizes him. And even though my silence protects me, I’m the one walking with my head down.” When the aforementioned Peter tells Jamilah (or, perhaps more accurately, Jamie) that he likes that she is not self-absorbed, she thinks to herself, “”News bulletin: I’m not obsessed with the sound of my own voice because I don’t have a voice. I’m stifling it beneath layers of deceit and shame.” Jamilah’s sense of vulnerability and shame is palpable throughout the novel, and conveys a strong message about the personal impact of racism. As the story progresses and Jamilah’s hold on the strict separation of her Australian and Lebanese-Muslim identities beings to weaken, she begins to realise the effect that this separation has had on her and on her relationships to the people around her. Cheesy? Well, yeah. And perhaps a bit simplistic, given the racism that was discussed earlier. It’s not as if just deciding to be yourself is necessarily going to make for an easy ride. But the sentiment is interesting, the idea that her attempts at self-preservation in fact become a form of self-destruction and self-silencing, and ultimately prove to be unsustainable. Okay, so the family stuff isn’t exactly subtle. The book is really clearly trying to make a point that families can be conservative and strict without filling the kinds of stereotypes that non-Muslims might expect. Although the lack of subtlety doesn’t make for amazing literature, I do have to say that the point is a good one, and it’s nice to see something that tackles these stereotypes head-on. Moreover, Jamilah is ultimately able to convince her dad to make small concessions: after some persuasion, she is able to get a part-time job, and after much persuasion, she is even able to go to her school’s formal. I think these changes speak louder than the direct points that she makes, since they demonstrate that her family’s rules are not carved in stone, and that restrictions can be resisted from within, without requiring some kind of saviour from the outside. I’m hoping that readers will understand that, by extension, other cultural rules (and resistance to them) can be equally dynamic, even when they seem monolithic and repressive from the outside. Religion plays a fairly minor role in the story; Jamilah identifies as Muslim, but this isn’t the focus of the novel (this is actually pretty refreshing—someone can be Muslim while also having lots of other dimensions to her life! Who knew?) Various family members demonstrate different levels of religiosity, which is presented as something normal. Even the hijab is—shockingly—not a major issue. Jamilah’s sister wears it, but it is talked about more as a fashion and political statement than a religious one (although it is acknowledged as both.) There are a few more direct conversations about religion (again with obvious points that the author wanted to convey, like when Jamilah’s aunt argues that, “The Koran has been manipulated and abused to exploit women”), but it was nice to see a story about a Muslim girl that didn’t only revolve around the fact that she was Muslim. I wasn’t thrilled with the cover of the book. 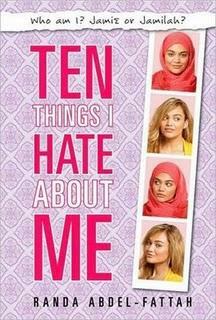 The cover features a strip of photos of a girl, alternatively wearing hijab and not wearing it. This annoys me, because although a lot of the book is about Jamilah trying to balance her Muslim-Arab cultural-religious identity with her Australian identity, she never talks about wearing a headscarf. Her Lebanese culture is talked about in terms of music and food, but not at all in terms of hijab, and it’s annoying to see that on the cover as the representative picture of Jamilah’s Lebanese-Muslimness. Moreover, what does this say about the picture where she’s not wearing hijab? Is that the picture where she’s “Australian”? Can’t she have her head uncovered and still be seen as Lebanese and Muslim as well as Australian? If the whole point of the book is to demonstrate that these identities shouldn’t be mutually exclusive of one another, it seems problematic that there is one way to “look” Arab and another way to “look” Australian. Overall, while it was often trying too hard to make its points, this book was an entertaining read, and an interesting look into the life of a girl trying to balance her cultures and religion, to cope with the racism and sexism that she faces, and to find a space where she feels at home. Thanks Julianne! I agree with you about the father. I understand that the author was probably trying to make a point about immigrants whose credentials aren't recognised and so on, and about the many taxi drivers out there who are very highly educated but can't get jobs in their fields, but I thought it was overdone. The narrator did explain at one point though that the jobs available in her father's field were in more rural areas, and the family didn't want to be the only Arabs in a small town, so it seems like that's the reason why he ended up driving a taxi. I read this recently and enjoyed it, but I agree with all the points you make about it. The repetition of the fact that Jamilah's father has a PhD but works as a taxi driver quite annoyed me - it was mentioned several times without going into why his life turned out like that. Did he find it impossible to get a job in academia because of racism or did something else happen? I really wanted to know and the information was never given.I thought the cover was pretty bad too - the edition I read (UK) actually has a picture of a girl without hijab on the whole of the front cover and a girl with on the back. From this I expected Jamilah to decide to wear hijab by the end but she doesn't. I guess it was a publisher's decision, they thought it was an easy way to signify what the book was about and completely ignored the fact that the images go against the message of the book. I personally think a different, smaller, image on the front and an actual blurb on the back would have been a lot better - I think there was one line on the copy I read! I only knew what to expect from the plot because I'd already read an online description.